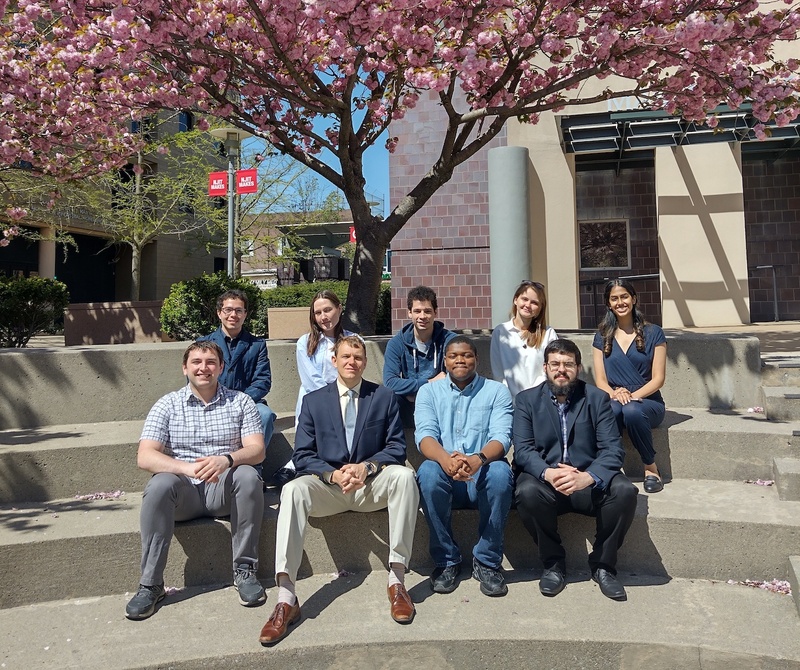 Professor Gennady Gor and his group focus on porous materials and confined fluids, ranging from nanoporous adsorbents and polymer membranes to geological materials, like coal and shale. We use various modeling techniques to represent phenomena at the nanoscale: Monte Carlo simulations, molecular dynamics, density functional theory, etc. Left to right: Nick Corrente, Taylor Kvist, Gennady Gor, Alina Emelianova, Max Maximov, Chris Dobrzanski. 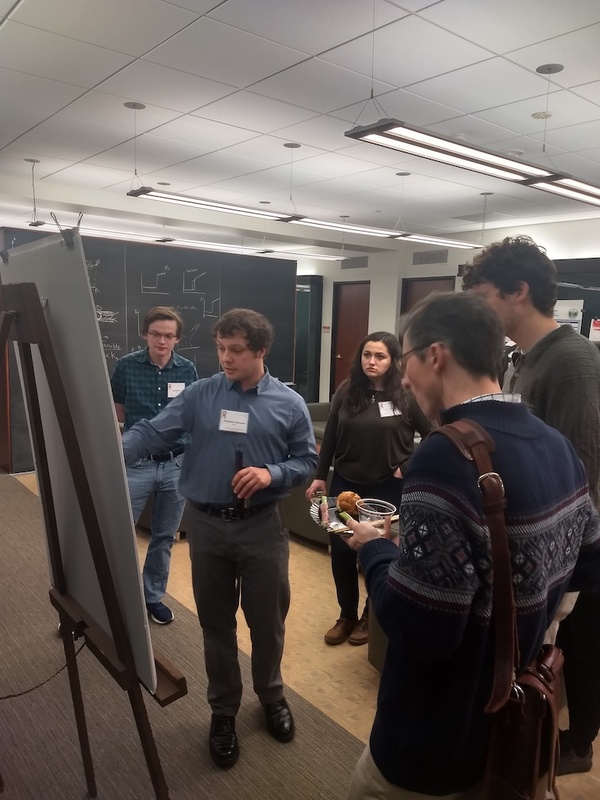 4/17/2019: Gennady gave a seminar "Elastic Properties of Confined Fluids Probed by Ultrasound and by Molecular Simulations" at the ExxonMobil Research and Engineering Company. 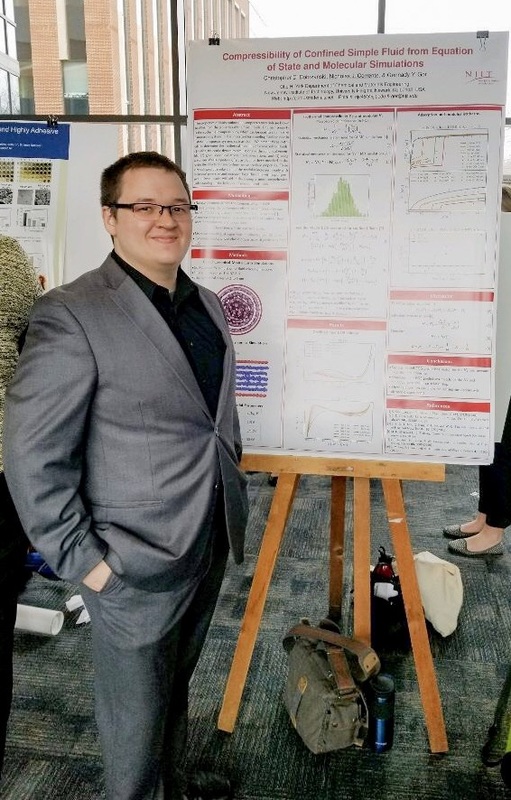 4/07/2019: Nick Corrente represented NJIT at the Undergraduate Research Poster Competition within the 2019 AICHE Mid-Atlantic Student Regional Conference at Pennsylvania State University, State College, PA (April 5-7, 2019). 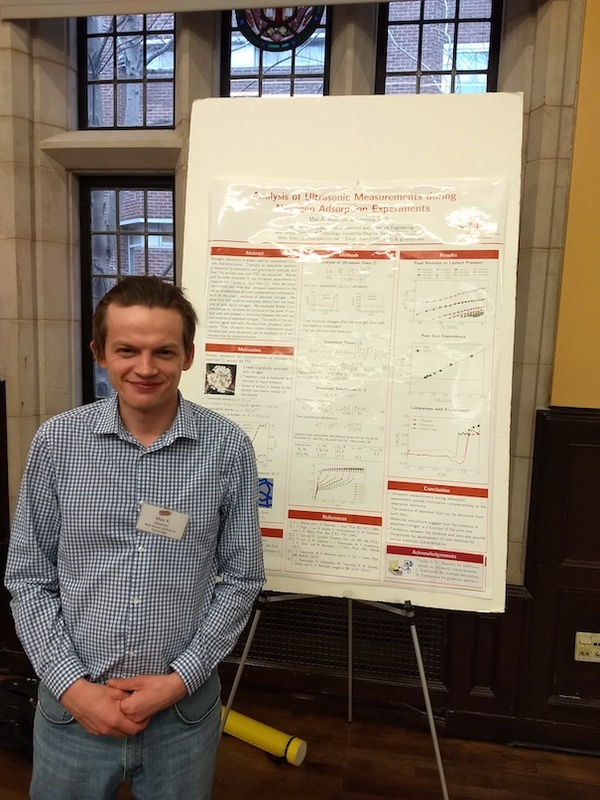 Nick presented a poster "Compressibility of confined simple fluid from an equation of state and molecular simulation". 2/28/2019: Gennady presented a talk "Compressibility of Simple Fluids Confined in Nanopores" at the seminar series of the Chemistry Department, Rutgers Newark. 2/25/2019: Gennady presented a talk "Compressibility of Simple Fluids Confined in Nanopores" at the seminar series of the Chemical Engineering Department, City College of New York. 2/19/2019: Gennady presented a talk "Molecular basis for ultrasonic characterization of nitrogen-saturated nanoporous materials" at the 1st Symposium on Acoustics of Nanoporous Materials at the Salford University, (Manchester, UK). 2/07/2018: Welcome to Marcos Molina, who joins the group as undergraduate researcher! 1/23/2019: Gor's group attended the Transport in Disordered Environments Workshop at Princeton University. Chris and Max presented their posters. 1/22/2019: Our paper "Mechanical Characterization of Hierarchical Structured Porous Silica by in-situ Dilatometry Measurements during Gas Adsorption" came out in Langmuir. This work is a continuation of our collaboration with ZAE Bayern, Paris Lodron University Salzburg, Montanuniversitaet Leoben and Rutgers University. 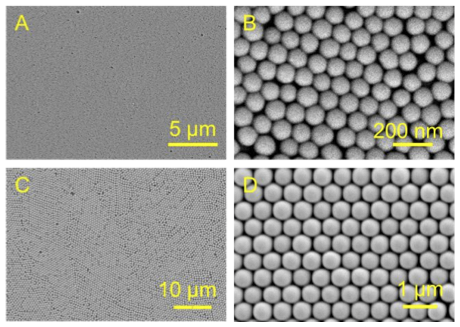 1/12/2019: Our paper "Porous Structure of Silica Colloidal Crystals" came out in Langmuir. This work is a collaborative work led by Prof. Galukhin, which presents the application of nitrogen adsorption to characterization of synthetic opals. Congratulations to Alina Emelianova, who carried out the modeling part of this work! 1/10/2019: Congratulations to Alina Emelianova on her succesful qualifying examination! 12/14/2018: Gor's group attended The 22nd Annual Meeting of Northeast Corridor Zeolite Association (NECZA). 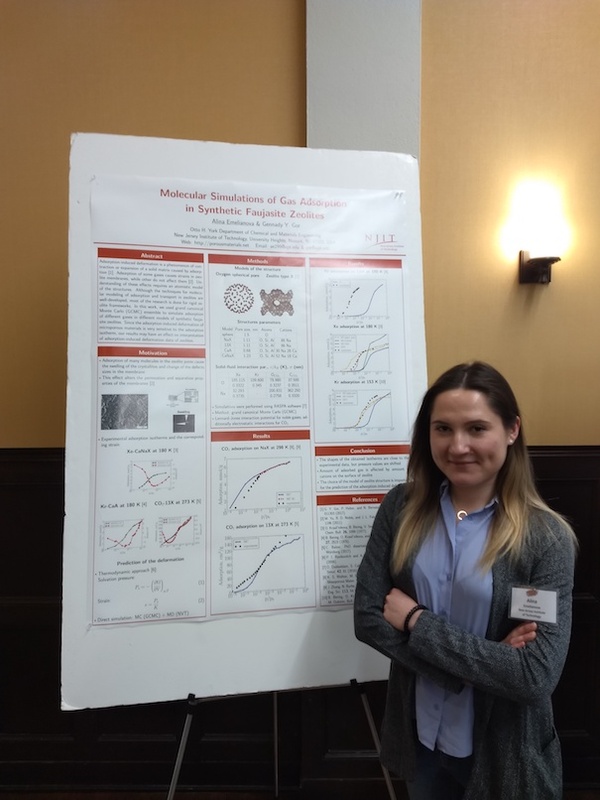 Alina and Max presented posters on "Monte Carlo simulation of adsorption in synthetic faujasite zeolites" and "Molecular Simulations Shed Light on Potential Uses of Ultrasound in Nitrogen Adsorption Experiments" respectively. 11/26/2018: Our new paper "Molecular Simulations Shed Light on Potential Uses of Ultrasound in Nitrogen Adsorption Experiments" came out in Langmuir. Congratulations to Max on his first paper! The PDF is available at DOI: 10.1021/acs.langmuir.8b02909. 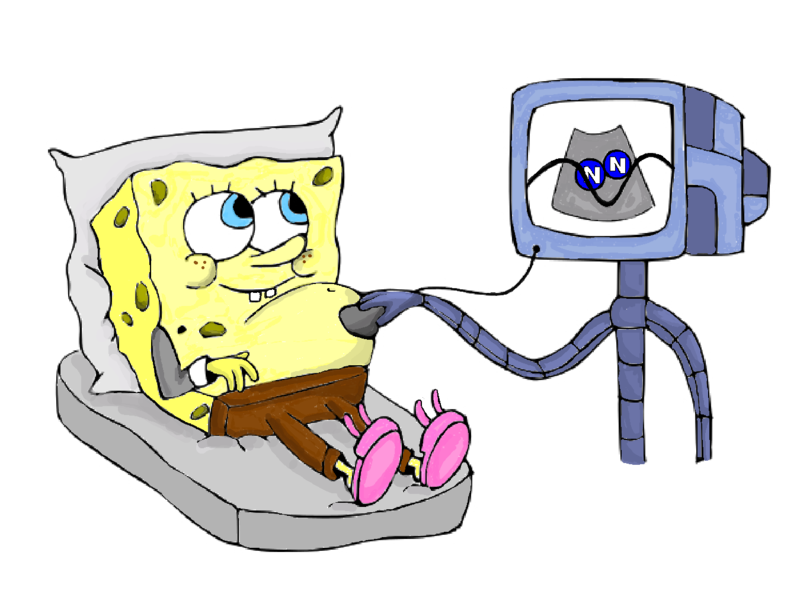 The idea of the paper is depicted in the cartoon below (drawn by Alina): one can use ultrasound to probe a porous body impregnated with nitrogen. 11/13/2018: Gennady Gor delivered an invited keynote presentation "Adsorption-induced deformation: solvation pressure and surface stress approaches" at the XIX Workshop on the Characterization of Fine and Porous Solids "Sorption Induced Deformation of Solids: Swelling and Shrinkage" organized by POROTEC GmbH. 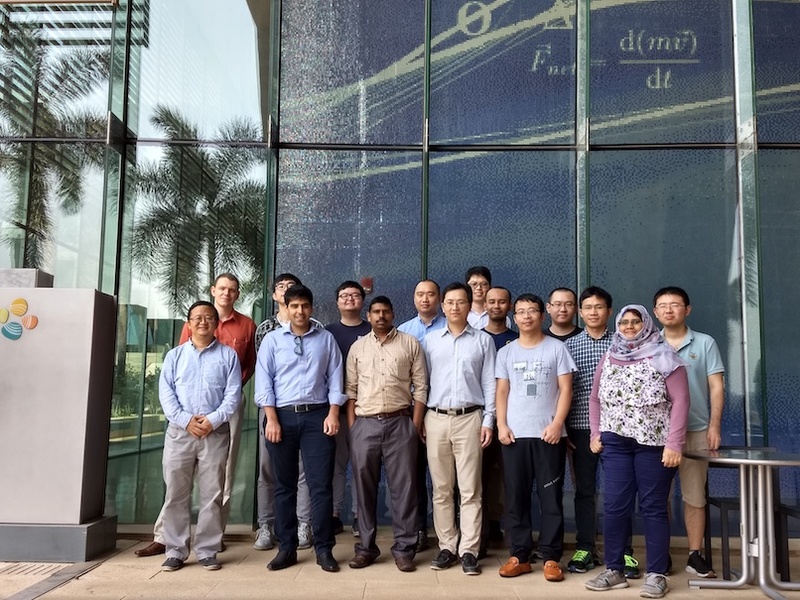 10/04/2018: Gennady Gor visited Prof. Shuyu Sun's Computational Transport Phenomena Laboratory at KAUST presenting a tutorial on "Modeling Adsorption-Induced Deformation in Nanoporous Materials" and giving a seminar "Elastic Properties of Fluids in Nanoporous Media: Molecular Simulation Insight" within the Earth Science and Engineering Graduate Seminar series. 9/18/2018: Max Maximov presented a poster on "Analysis of Ultrasonic Measurements during Nitrogen Adsorption Experiments" at the 1st North American Symposium on Dynamic Vapor Sorption Science generously supported by Surface Measurement Systems. 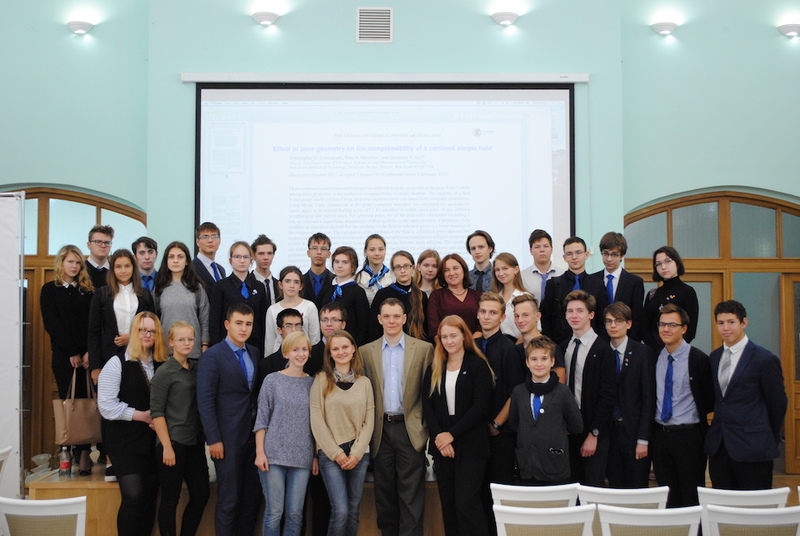 9/15/2018: Gennady Gor presented a lecture for the high-school students at 30ka, one of the top Russian high schools, specialized in math and physics. The topics covered included the basics of molecular modeling, as well as a Q&A on careers in STEM. 9/07/2018: Welcome to Duyen Nguyen! Duyen is a new Ph.D. student in Khalizov group, co-advised by Gennady Gor. 8/30/2018: Gennady Gor gave a seminar at Edgewood Chemical Biological Center on "Mechanical Effects of Fluids Adsorption in Nanoporous Materials"
8/06/2018: Congratulations to Chris Dobrzanski on his succesful dissertation proposal defense! 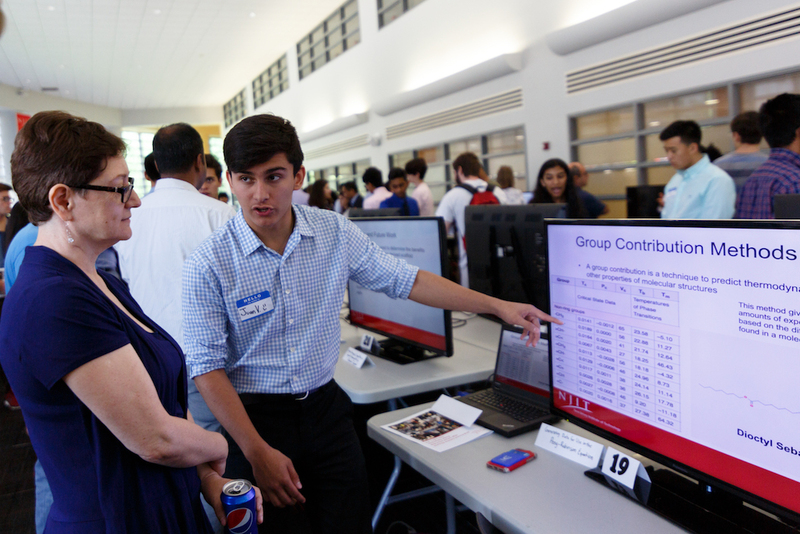 8/03/2018: Our high school students presented at the Provost High School Interns Poster Symposium. 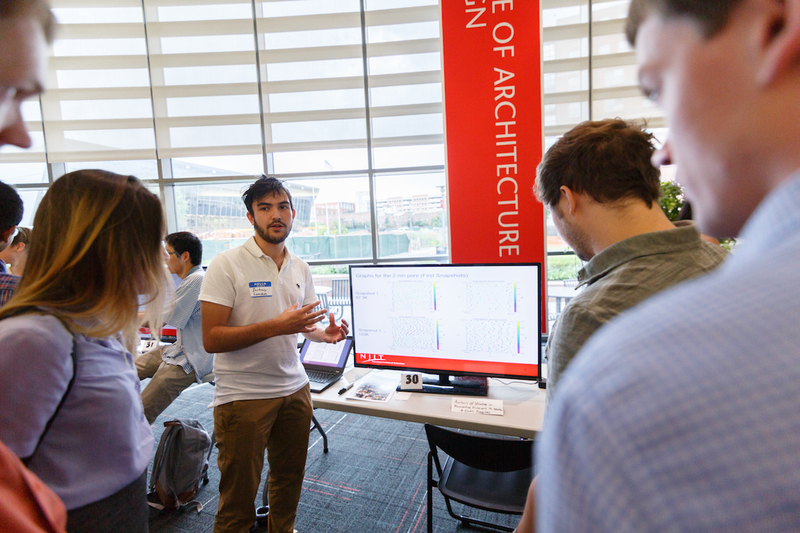 Zach Lyandres spoke on "Analysis of Structure of Nanoconfined Fluids and Relation to the Elastic Properties" and Juan Valencia on "Predicting the Vapor Pressures for Low-Volatile Organic Compounds". These excellent presentations would not be possible without their mentors: Nick, Chris, Emma and Max. 7/13/2018: Gor's group attended a RASPA Workshop at Northwestern University. For Nick, Chris, Alina and Max, it was a great opportunity to attend the lectures by world-class experts in Monte Carlo simulations, and to get hands-on experience with RASPA -- a powerful molecular simulations code. 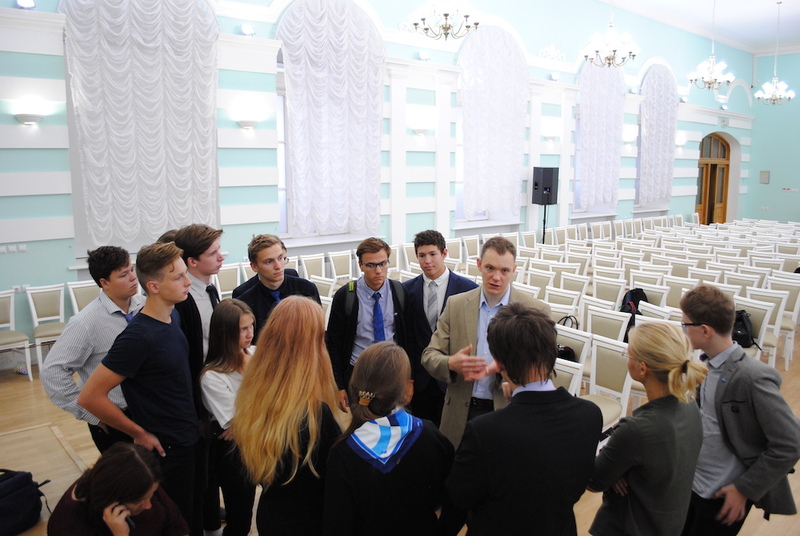 7/06/2018: Gennady Gor attended a Conference Cluster held in Suzdal, Russia, presenting an invited key lecture "Mechanical Effects of Fluids Adsorption in Nanoporous Materials" at the International Symposium "Smart materials" and a lecture "Modeling Adsorption-Induced Stresses in Nanoporous Materials" at the Summer School "Modeling of smart materials"
6/27/2018: Gennady Gor visited the Acoustics Laboratory at St. Petersburg State University and gave a seminar on "Compressibility of Fluids Confined in Nanopores"
6/01/2018: Congratulations to Max Maximov on his success on the qualifying exam! 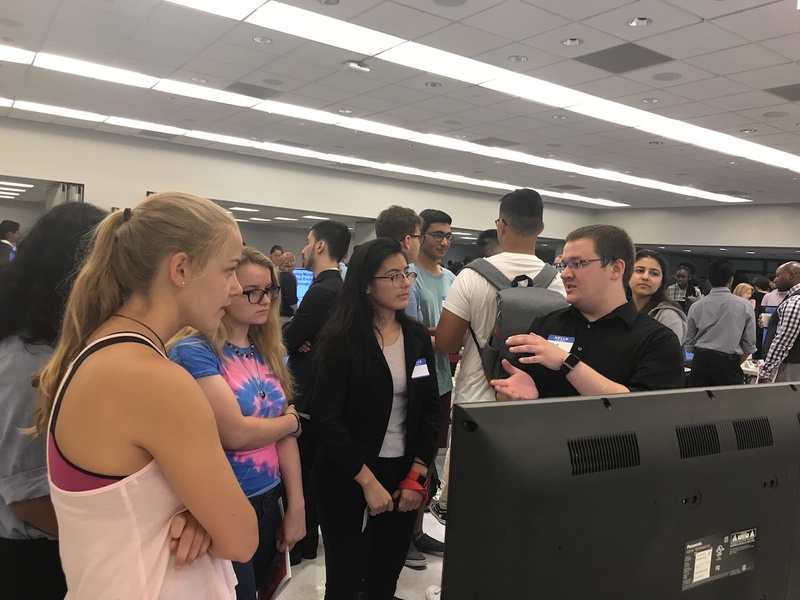 5/18/2018: Gennady Gor organized a first NJIT Molecular Simulations Mini-Workshop. 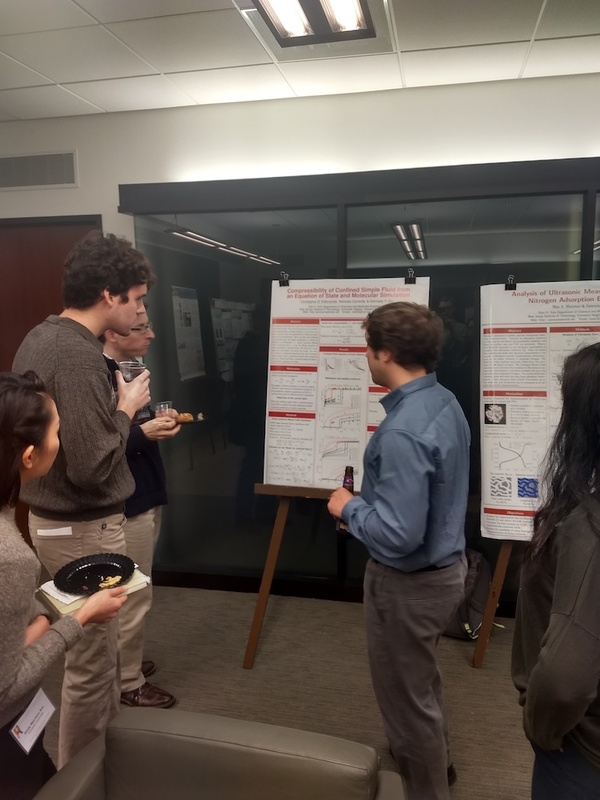 This workshop brought together NJIT researchers working in molecular and atomistic modeling across the disciplines. 5/17/2018: Gennady Gor attended the Jubilee Interpore Annual Meeting in New Orleans and together with Prof. Patrick Huber organized the minisymposium "Fluids in Nanoporous Media". This year was the third year of the minisymposium, which remains the largest at the Interpore Meeting with 20 oral presentations and a number of posters. 5/09/2018: Gor's group attended the CPM8 workshop, presenting two posters and an oral contribution. 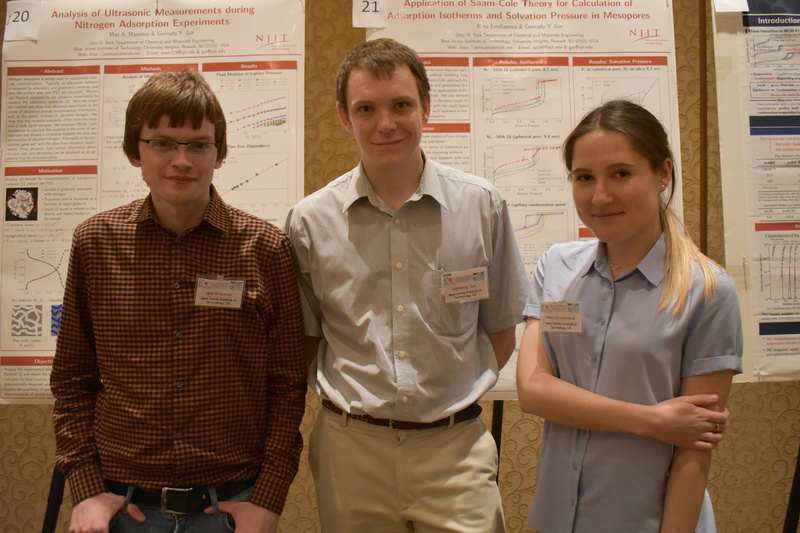 Congratulations to Max Maximov and Alina Emelianova with their first presentations on an international meeting! 5/07/2018: Congratulations to Zachary Lyandres (Tenafly High School) on 2018 Provost High School Summer Research Internship. He will spent his second summer working with the Gor's group and learning what computational research is. 4/30/2018: Congratulations to Nick Corrente on 2018 Provost Summer Research Fellowship Award. This award will allow Nick to focus on his research project full-time during this summer. 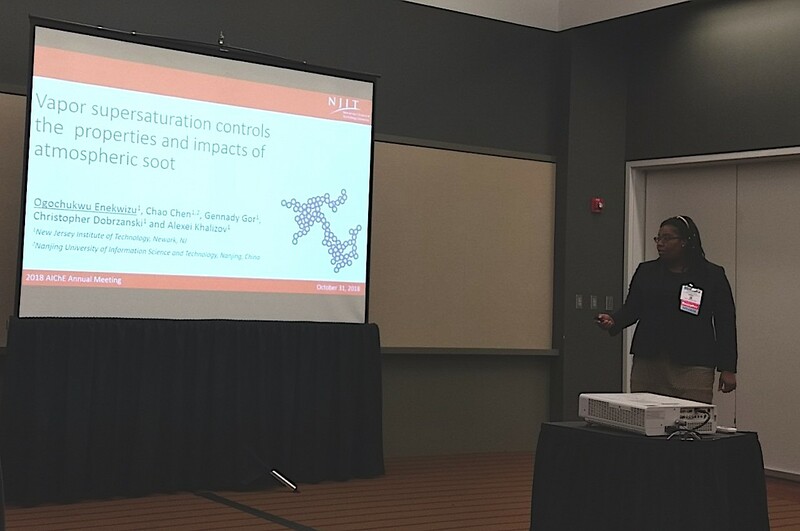 2/23/2018: The presentation "Analytical Model for Vapor Condensation on Soot Agglomerates" by Gennady Gor, Chao Chen and Alexei Khalizov was named the Best Presentation of the Session at the 2017 AIChE Annual Meeting in Minneapolis. 1/30/2018: Welcome to Taylor Kvist and Nick Corrente, who join the group as undergraduate researchers! 1/10/2018: Welcome to Alina Emelianova, who joins the group as a Ph.D. student! 1/03/2018: Congratulations to Chris Dobrzanski on his first journal publication, which has been accepted to J. Chem. Phys.! In this work we simulated liquid argon in model nanopores and calculated its compressibility. 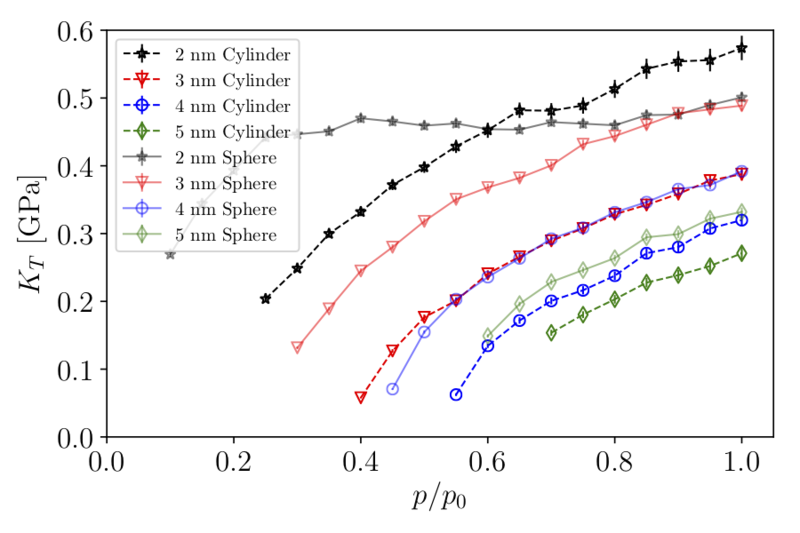 We showed that along with the pore size, the pore shape affects the elastic modulus of confined argon: argon is a spherical pore is stiffer than in the cylindrical pore of the same size. 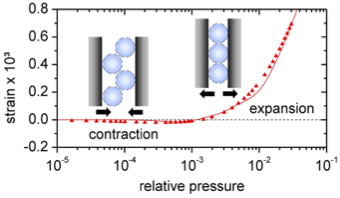 This observation suggests that elasticity of confined fluids can be used as a quantitative measure for calculation of pore size distribution of a nanoporous sample. 12/28/2017: Our new paper "Gassmann Theory Applies to Nanoporous Media" (by Gennady Gor and Boris Gurevich) came out in Geophysical Research Letters. Gassmann theory describes the propagation of sound waves in fluid-saturated porous media, which is essential for exploration geophysics. Does this theory apply to nanoporous media, such as shales? For shales it still remains an open question, yet our paper showed that for a model nanoporous medium, Vycor glass, the Gassmann theory works. 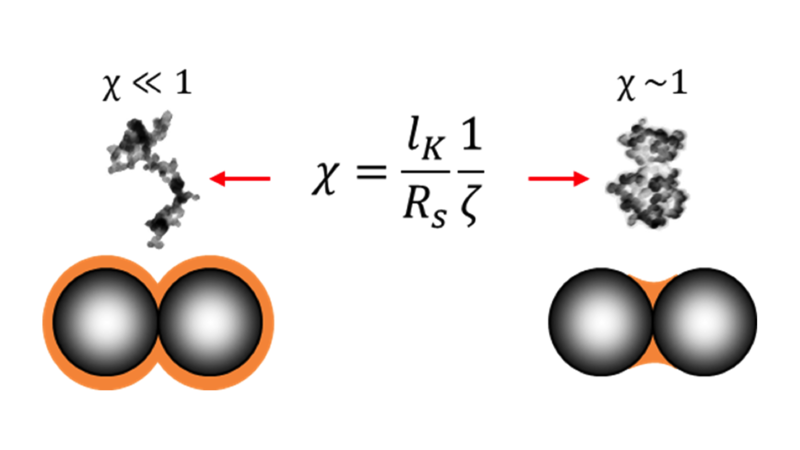 In order to apply the Gassmann equation for such system, the fluid properties have to be modified to take into account the solvation pressure in the nanopores. Our findings set up a theoretical framework for investigation of fluid-saturated nanoporous media using ultrasonic elastic wave propagation. 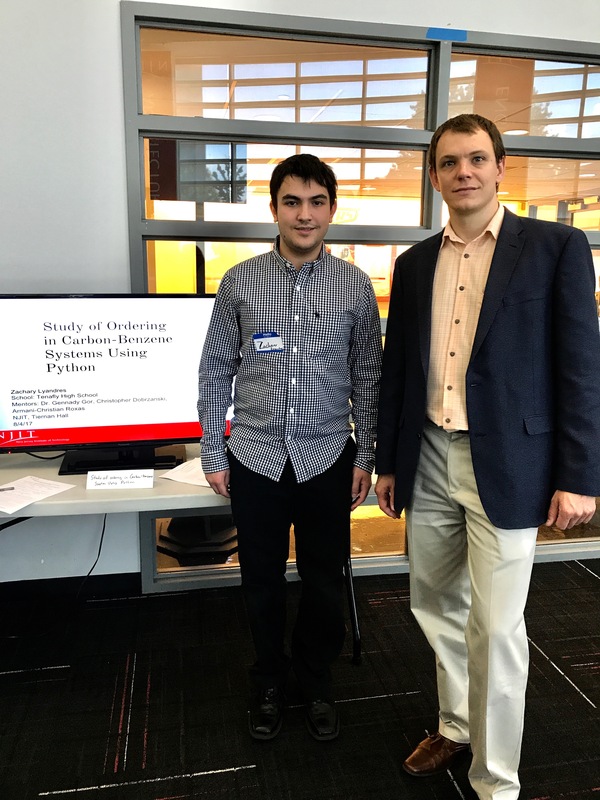 11/06/2017: Max Maximov and Chris Dobrzanski present their works at the 2017 Annual Meeting of the American Physical Society Mid-Atlantic Section. Both works employed Monte Carlo molecular simulations to model thermodynamics of fluids in the nanopores. Max spoke on "Argon Adsorption in Three-Dimensional Ordered Mesoporous (3DOm) Carbons: Monte Carlo Molecular Simulation Study" and Chris on "Calculation of elastic properties of argon confined in nanopores of various morphologies using grand canonical Monte Carlo"
11/01/2017: Gennady Gor attends AIChE annual meeting, presenting the results of Christopher Dobrzanski's work "Compressibility of Argon Confined in Nanopores: Effect of the Pore Geometry" and a joint work with Khalizov's group "Analytical Model for Vapor Condensation on Soot Agglomerates"
10/17/2017: Gennady Gor gives a talk "Fluctuations of number of particles in the fluid confined in a nanopore" at the 5th Russian conference "Metastable States and Fluctuation Phenomena" held in in Yekaterinburg (Russia) at the Institute of Thermal Physics of the Ural Branch of the Russian Academy of Sciences. 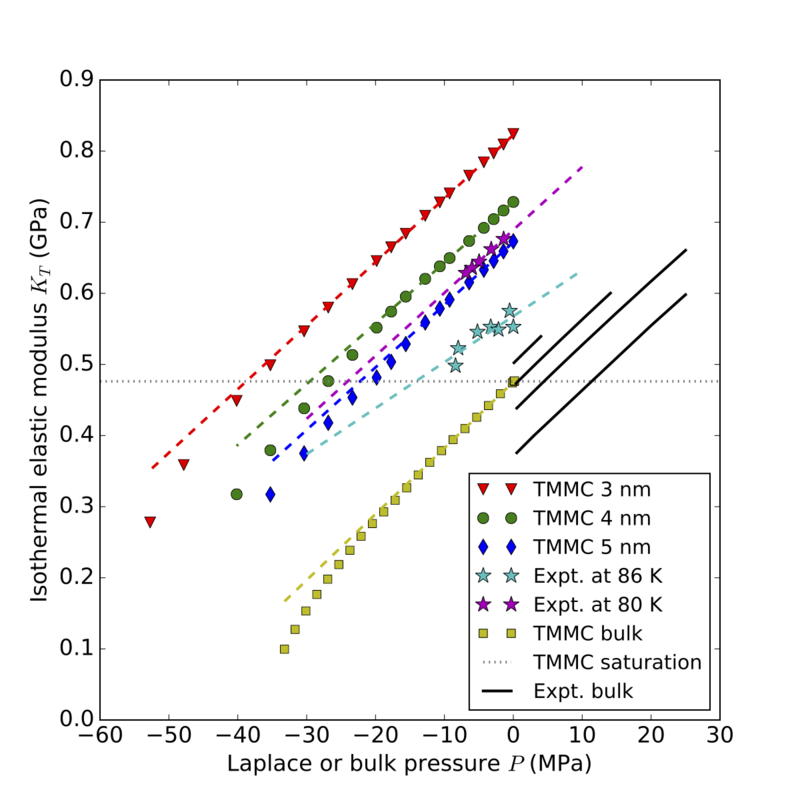 This work demonstrated how compressibility of confined fluid can be extracted from the Monte Carlo simulation in the grand canonical ensemble (GCMC). 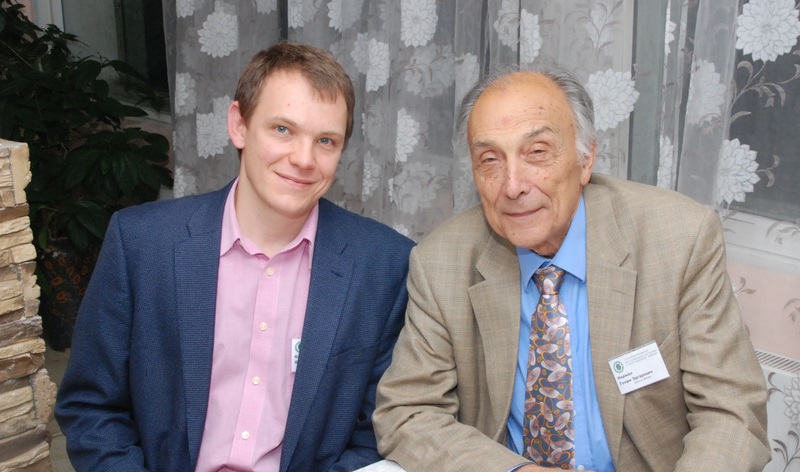 Ironically, among the conference participants was famous Professor Norman, the father of the GCMC method. 9/19/2017: Lukas Ludescher joins the group as a visiting Ph.D. student. Lukas is a Ph.D. student in Montanuniversitaet Leoben, where he works on a collaborative project on sorption-induced deformation. He came to the US to work on the computational aspects of this project. 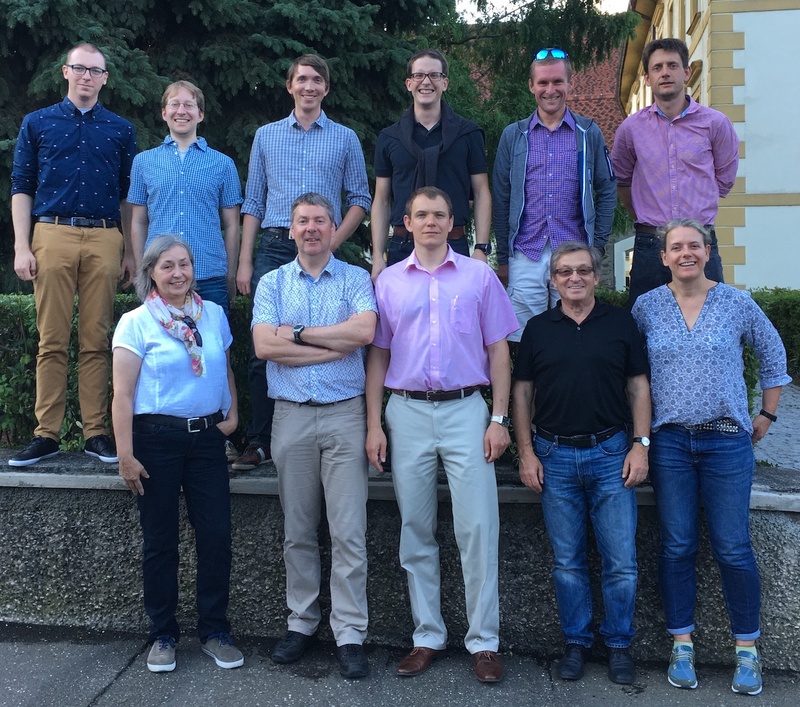 7/28/2017: Gennady Gor visits the DuPont Experimental Station (Wilmington, DE) and gives a seminar "Compressibility of the fluids confined in the nanopores"
7/17/2017: Gennady Gor attends the "DIANA" workshop organized by Oskar Paris at Montanuniversitaet, Leoben, Austria. In addition to discussing the collaborative work on adsorption-induced deformation of hierarchical mesoporous structures, he gives a seminar "What can we learn about elasticity of nanoporous material from elasticity of fluid in its pores?" 6/19/2017: High school students Marcelo Munoz and Zachary Lyandres join the group to carry out research during the summer. 5/19/2017: Gennady Gor gave an oral presentation "Elastic Properties of Confined Fluids and their Application for Characterization of Porous Materials" at the XI International Conference on Characterization of Porous Solids in Avignon. Two other contributions based on the collaborative work of Dr. Gor with ZAE Bayern (Germany) were presented at the conference by Christian Balzer. 5/12/2017: Christopher Dobrzanski and Gennady Gor attended the Interpore conference in Rotterdam. Christopher presented the results on his research obtained within the 1st year of his Ph.D. studies. 4/26/2017: Armani-Christian Roxas has been awarded the 2017 Provost Undergraduate Summer Research Scholarship to carry out research in the Gor's group during the Summer 2017. Armani will be working on modeling interactions of soot particles with polycyclic aromatic hydrocarbons using molecular dynamics simulation. 3/17/2017: Gennady Gor presented his research on mechanical effects of adsorption at several seminars in St. Petersburg and Moscow: Molecular Physics Department at MEPhI, Institute of Problems of Mechanical Engineering Russian Academy of Sciences, St. Petersburg State Technological Institute, SCAMT laboratory at ITMO University, Laboratory of Physics of Nanostructures at St. Petersburg National Research Academic University. 2/24/2017: Gennady Gor has published an invited review paper on adsorption-induced deformation of nanoporous materials in the journal Applied Physics Reviews. 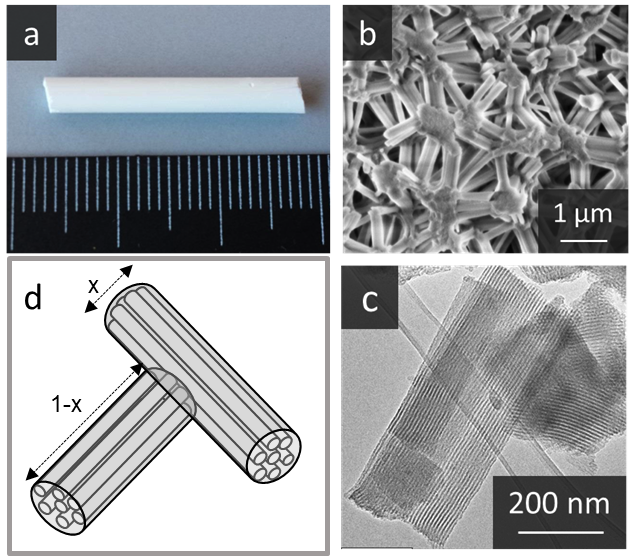 Nanoporous materials play an important role in many chemical engineering applications, in particular they are used as adsorbents. 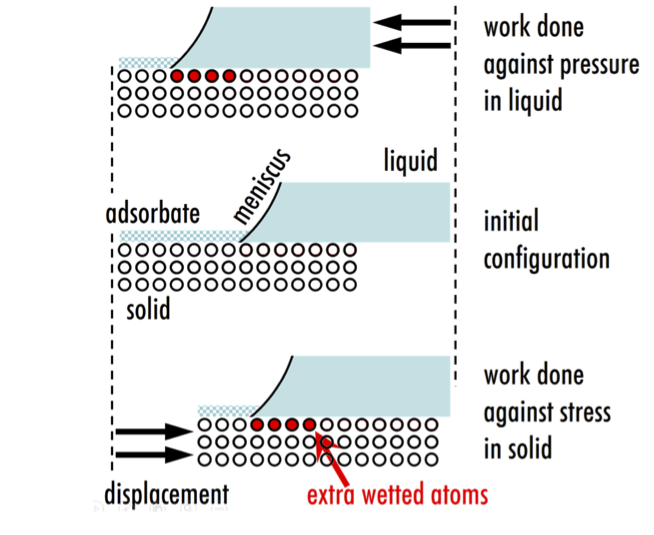 When fluids get adsorbed in the pores that are only a few nanometers wide, the intermolecular forces between the fluids and solids induce very high pressures. These pressures can reach hundreds of atmospheres and cause noticeable deformations even in stiff solid materials. 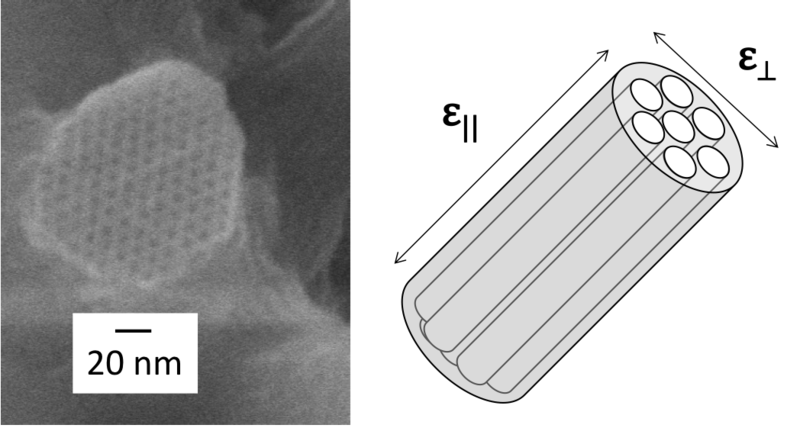 The review paper discusses a variety of cases where these strains are significant: change of permeation of zeolite membranes, swelling of coal, etc. 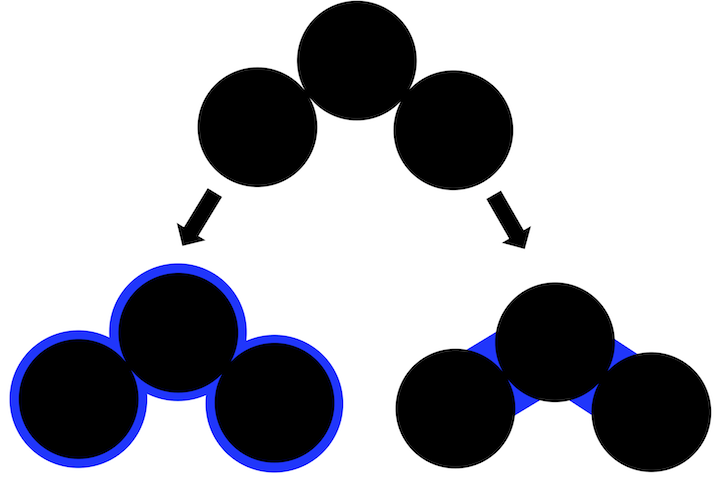 and presents the state-of-the art theoretical understanding of this phenomenon. 1/28/2017: Gennady Gor presents a simple analytical model for condensation-induced restructuring of soot agglomerates at the 35th Northeast Regional Meeting on Kinetics and Dynamics. These are the first results on the collaborative project with Khalizov's group, supported by NJIT Seed grant. 11/20/2016: Dr. Gor organizes Minisymposium Fluids in Nanoporous Media at the Interpore-9 conference. The abstracts for poster presentations are still accepted. More information. 10/26/2016: Molecular simulations suggest that argon confined in a mesopore satisfies classical Tait equation, linear relation between elastic modulus and pressure. Moreover, the slope of this linear relation is the same as for bulk liquid argon. This is the main result of the new Dr. Gor's paper in J. Chem. Phys. This result can be used to determine elastic properties of nanoporous materials. 9/16/2016: Dr. Gor received NJIT seed grant to work on restructuring of soot nanoparticles in collaboration with Dr. Khalizov. More information. If you find that any information on this web page is obsolete, or any of the hyperlinks do not work, etc. please email me. I will very much appreciate your help in keeping this webpage up to date.